POWERED by a five-goal haul to James Sellar, Melbourne scored its first win of 2013, holding off a desperate last-term challenge from Port Adelaide to prevail by two points, 0.12.6 (78) to 1.10.7 (76) in their NAB Cup meeting at Renmark on Sunday afternoon. Sellar thrived in the absence of Chris Dawes, kicking the game's first major and having a hand in Melbourne's second to finish with four in the first half. Demons defensive coach Jade Rawlings said Sellar's five goals was a sterling effort, and showcased his mental strength given he had spent the summer as a defender. "I was really pleased with Sellar because he's done most of his training down in the backline," Rawlings said. "He can ruck, he can play key back, he can play key forward, and whilst it'd be great to be able to set him down in one spot, the lay of the land is that you need to be flexible … mentally he's quite strong to be able to absorb that." Melbourne endured a heart-stopping finish to the game, with the Power sparked by a Hamish Hartlett supergoal. Trailing by 25 points in the last quarter, Hartlett's goal from outside 50 was the first of three Power goals to reduce the lead to just four points. Ruckman Jarrad Redden and rookie Kane Mitchell then both missed chances to put the home side in front. The damage was done in the first half, with the Power's sloppiness when in possession allowing the Demons easy access to goal on the fast break. Kicking into a slight breeze on what was an impeccably prepared Renmark Oval, the Power won more than their share of the footy in the first half, but poor execution and overuse ensured they were under constant scoreboard pressure. Exciting Power rookie Mitchell was everywhere and racked up 12 first-term touches to finish with 26, showing why he's odds-on to be elevated to Port's senior list. Melbourne’s hard-nosed rookie James Magner (24 disposals) was sensational, leading his side from the front with a dominant first-half performance that included five clearances and nine contested possessions. Young Power hope Sam Colquhoun (19 disposals) lived up to his 'ball magnet' tag and did his bit to help his side's cause with 12 touches and a goal assist to half time, while Oliver Wines (21 touches) managed five clearances and 11 touches. Back-to-back Power goals inside the first five minutes of the third term saw Melbourne's lead reduced to eight points before Daniel Stewart brought his side within a point with his third major. The home side was hitting the contest hard, none harder than Wines, who put in his most impressive display to date. Sellar's fifth eased the pressure on Melbourne late in the third term, and when Aaron Davey booted his third major in the final quarter after another Power turnover, the result looked to be sealed. While the Power finished strongly, the Dees claimed bragging rights ahead of the meeting between the sides in the opening round of the home-and-away season. Rawlings said Magner had thrust his name into round one selection calculations with terrific work around the stoppages. "He played pretty solid footy, Magner, I think he had 15 contested possessions and he put a bit of pressure on to get into the best team," Rawlings told AFL.com.au. "Today's performance certainly gives him every opportunity to put himself in the mix." Port Adelaide coach Ken Hinkley praised his side's competitive spirit for the way in which the side fought to remain in the contest, but conceded the damage was done early. He said that while he was able to observe some of his younger, less experienced players on Sunday, the Power's squad to face West Coast next Sunday in Alice Springs would be closer to full strength. "We fought the game out … and we were probably our own worst enemy. At the end of the day we just overused the ball too much," Hinkley said. "We felt a bit of pressure, and when pressure comes you sometimes just bail out … all you're going to do is create more pressure. "Next week we'll be trying to bring our best players in and play our best side that we could possibly get on the park next week." What it means: The Power again hurt itself with its inability to hit targets when under pressure. The side regularly overused the ball, particularly in the first half, which led to players then turning the ball over to a side ready for the fast break. Despite the loss, there were promising signs for the Power. Oliver Wines was a standout with 10 clearances, while Sam Colquhoun and Kane Mitchell both showed plenty of promise. Despite Port handling the ball a lot more in the first half, Melbourne was able to lead at every change, which was indicative of its ability to make the most of any opportunity it got. With both clubs resting its stars, neither would be able to take any match-winning secrets into their round one clash, but the Demons certainly looked the better side for most of the day. Rookie James Magner pushed his cause to be upgraded to the senior list, while James Sellar showcased his versatility up forward with five goals. What they said: "We were probably our own worst enemy at the end of the day. We just overused the ball too much early on and then we got going a little bit and ran out of time … they were just a little bit more ferocious at trying to get the ball. Our best clearance player was Ollie Wines who had 10 out of our 21 clearances." "We had 18, 19 inside 50s and scored 12 times, so it's a pretty good return. I was pleased we were able to capitalise on those opportunities even though we were being out-contested early in the game." 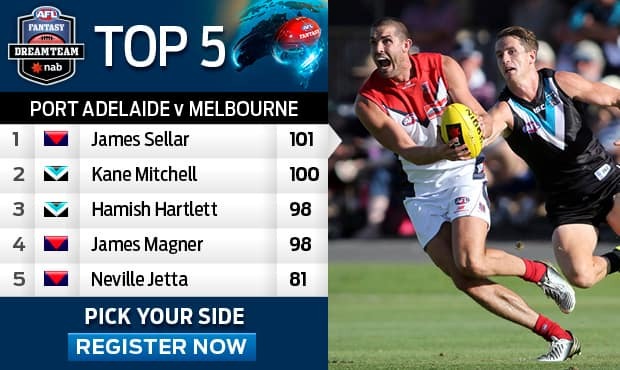 Fantasy spotlight: Although spending the bulk of the pre-season training as a defender, Melbourne's James Sellar showed he could prove a Dream Team dark horse up forward – he was the only Demon to crack the ton (101). His five-goal haul was a career-best, though, so don’t expect such output each week. 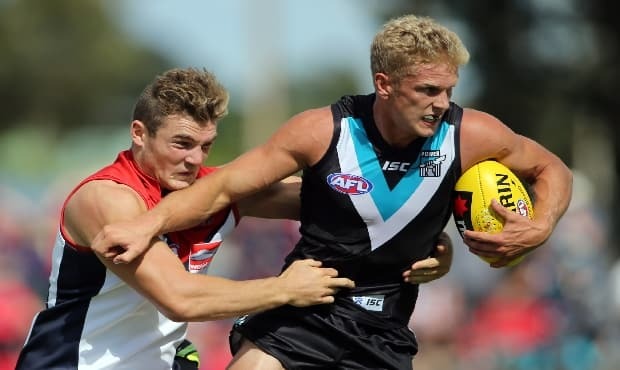 Rookies from either side in James Magner (Melbourne) and Kane Mitchell (Port Adelaide) both looked capable of pulling in big points with 98 and 100 respectfully, while Hamish Hartlett's 98 points showed that if he can remain fit, he could step up in 2013 to become a must-have. Sign up for NAB AFL Fantasy.